The tower defense app that helped cement the iPhone as a legit gaming platform will receive a sweet-looking sequel. With so many iOS games released on a yearly basis, it's easy to forget about the titles that helped define the App Store in 2008, back when everyone didn't know what to expect from the iPhone as a gaming device. That said, Subatomic Studios was right there with Fieldrunners, a critically acclaimed tower defense game that quickly became a worldwide hit, as thousands of strategy-crazed players did their best to thwart invasions while on the go. 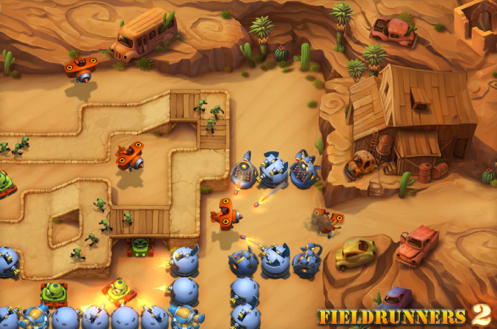 On that note, we're pleased to announce that the dev will release Fieldrunners 2 near the end of June exclusively for the iPhone. Details are scarce, but Subatomic promises new levels (20 total), enemies, weapons and ways to play. You can also expect puzzle and sudden death maps. It's been a while since we fired up the original Fieldrunners, and with this sequel on the way, we can't wait to dive back into the universe.